The phrase “population health” is increasingly being used by medical technology companies, researchers, practitioners, health care and public health policymakers, and other providers in the health care field. Seek a definition and you will receive various answers. Although their interpretation of this phrase may differ, what remains consistent is the intent to improve health outcomes in the communities they serve. To accomplish this, it is essential for providers to include an effective obesity medicine program. Why obesity medicine? Obesity is not only a chronic disease that affects over 35% of adults in the US, but it is often the root cause or associated with over 59 comorbidities that are included in the $255 billion direct and indirect annual obesity-related health care costs. As indicated by multiple research studies, the key to reversing the trends of this health epidemic is effective intensive obesity behavioral counseling. It is recommended both as a front-line treatment and in concert with other treatment modalities. Yet historically, the lack of provider time, training and/or reimbursement has limited the provision of obesity counseling services in the health care setting – until now. 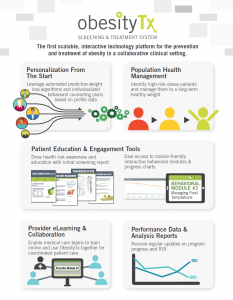 Obesity TX, powered by PondusHealth and The Center for Medical Weight Loss (CMWL) is the first scalable, interactive system for the prevention and treatment of obesity in a collaborative clinical setting. 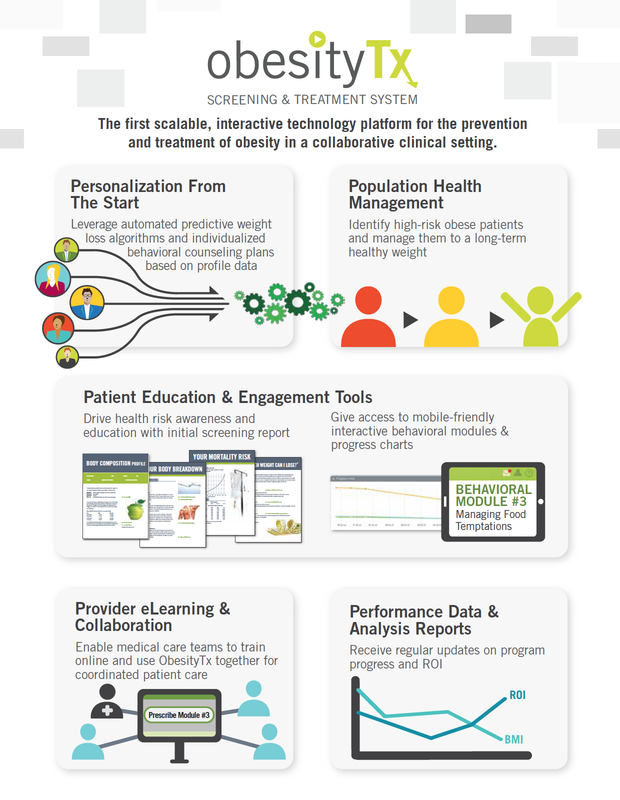 The medical provider-directed Obesity Treatment System (Obesity TX) and platform includes screening technology and personalized treatment options centered around intensive behavioral interventions. Through Obesity TX, employers, health care organizations, primary care and medical providers are able to track employee progress, risk factors and measurable outcomes in an aggregated, HIPAA-compliant reporting format. Outcomes and data supporting those outcomes are the crucial difference in a successful Population Health Management program. In June 2013, the American Medical Association recognized obesity as a chronic disease requiring a range of medical interventions. Adherence to the guidelines established by the US Preventive Services Task Force regarding the implementation of obesity screening and counseling for adults will result in impactful outcomes for obese patient populations. 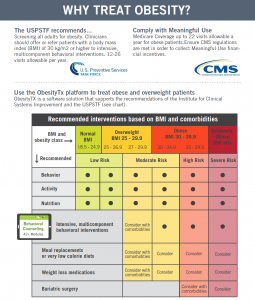 By leveraging the primary care and medical provider patient relationship, employers and health care organizations can address obesity effectively when managing their high-risk obese patient population, (BMI 30+). Obesity TX allows providers to screen patients and provide clinically-proven care as published in the American Journal of Medicine in 2012.4 Short-term, patients lose 11% in the first 12 weeks. At 12 months, they lose 15% and at 24 months average weight loss is 25lbs. or 12% weight loss maintained.5 Compliance, sustainability and outcomes data are three key competitive differences with Obesity TX. Medical providers’ no longer need to feel ill equipped or uncomfortable having discussions with their patients about the health risks associated with obesity. With a red, yellow, green iconic identification protocol, patient’s risk factors are identified and addressed in their screening process and prescribed a personalized program to help them through their individual health improvement journey. And it is covered by insurance. The Affordable Care Act is helping to increase patient access to medical weight loss services by requiring insurance plans to cover screening and counseling for obesity with no patient cost sharing. CMS covers up to 22 visits for Medicare patients with a BMI of 30+6. For corporate onsite clinics that do not charge their patients it may be a non-issue, but for those that process visits as claims it makes a big difference. Obesity TX is a complement to existing wellness programs, easy to integrate into any clinical care setting and addresses gaps in current Population Health Management programs. 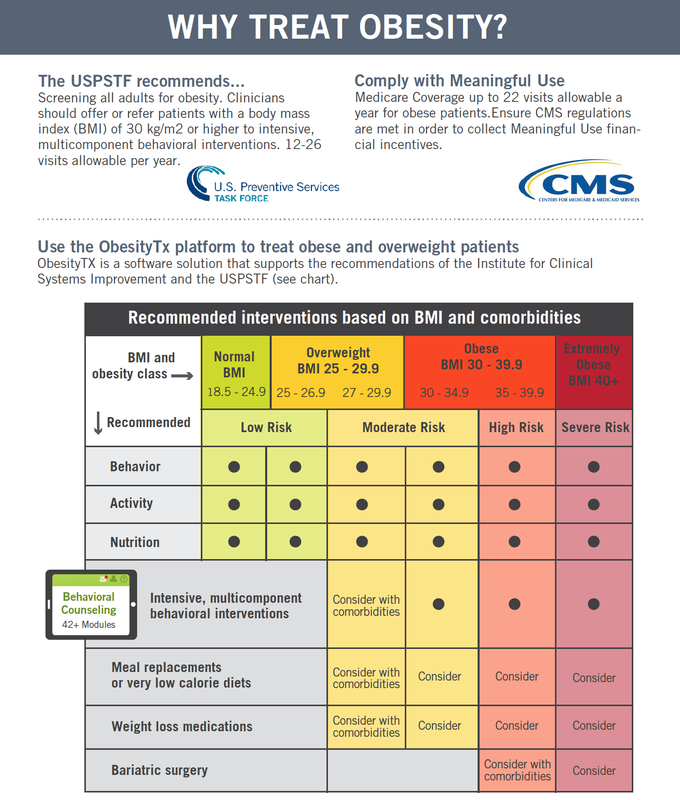 1 Screening for and Management of Obesity in Adults: U.S. Preventive Services Task Force Recommendation Statement. Annals of Internal Medicine. 2012;157(5):373-378. 2 Federal Register. Health Insurance Issuer Standards Under the Affordable Care Act, Including Standards Related to Exchanges. 45 C.F.R. § 156.125. 3 Jensen MD, Ryan DH, Apovian CM, et al. 2013 AHA/ACC/TOS guideline for the management of overweight and obesity in adults: a report of the American College of Cardiology/American Heart Association Task Force on Practice Guidelines, and The Obesity Society. J Am Coll Cardiol. 2013; online. 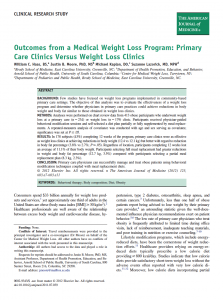 4Haas W; Moore J; Kaplan M; Lazorick S. Outcomes from a Medical Weight Loss Program: Primary Care Clinic Versus Weight Loss Clinics. The American Journal of Medicine. 2012: 125 (6), pg. 602.e7-603.e11. 5 2-Year research based on data collection over 30 months starting with 5499 new patients following the CMWL program. 6 https://www.cms.gov/Outreach-and-Education/Medicare-Learning-Network-MLN/MLNMattersArticles/downloads/MM8874.pdf .